The Wagner Fine Coat 9900 Plus a handy low-pressure spraying system, particularly useful for quick and cost-effective work on small areas. The Wagner HVLP turbines are easy to operate which makes them the ideal units for new users. Equipped with optional spray attachment accessories. The Wagner Fine Coat 9900 Plus is a High-performance tool, with an easy-to-use design. Permits precise application to the object being painted and provides a distinctive, fine spray pattern – suits water based and oil based materials. The HVLP systems from Wagner offer the best atomisation in the industry. 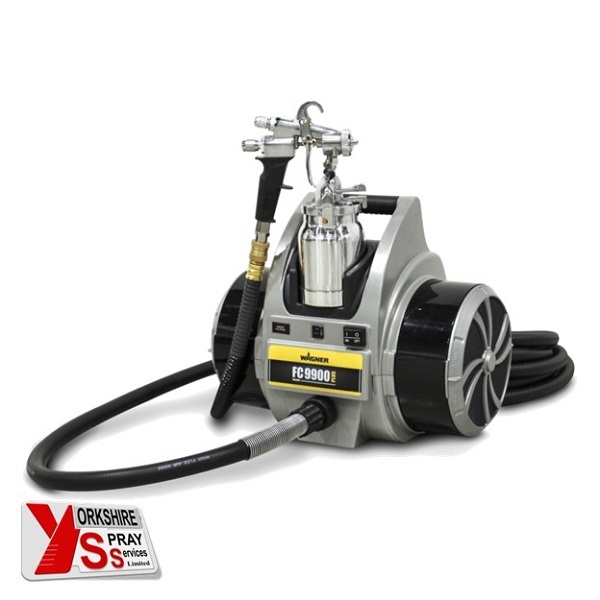 The handy low-pressure spraying systems are particularly useful for quick and cost-effective work on small areas. The turbines are easy to operate which makes them the ideal units for new users. The Wagner FC9900 Plus HVLP system provides 15% better atomisation, and reduces preparation and clean up time to help keep you more productive. In addition, the Wagner FC9900 Plus is a 5 stage turbine producing 10.2psi, making it the most powerful unit available today. Dual Filtration System – Wagner’s Dual Filtration System is the most advanced on the market. It uses two separate filtration chambers for atomising and cooling air for a cleaner, smoother finish. Features include filter sized to ensure clean operation and longer life; patented filter warning system tells you when to clean the filter and is easier to clean than bulky, automotive-style filters. The Wager Fine Control HVLP Turbine Units. Ideal for residential, commercial & maintenance applications.